For various reasons, the realization of the V International Seminar Rroma was an unavoidable event, not only to accompany and highlight the 20th anniversary of uninterrupted activity in the Maranatha Federation we have been celebrating, but also and above all, by the need to revise and analyze inclusion policies in the framework of the 2020 strategy they are being developed. That is, determine whether they are meeting the expectations and the commitments made by the Government of Europe but also by national and regional governments. 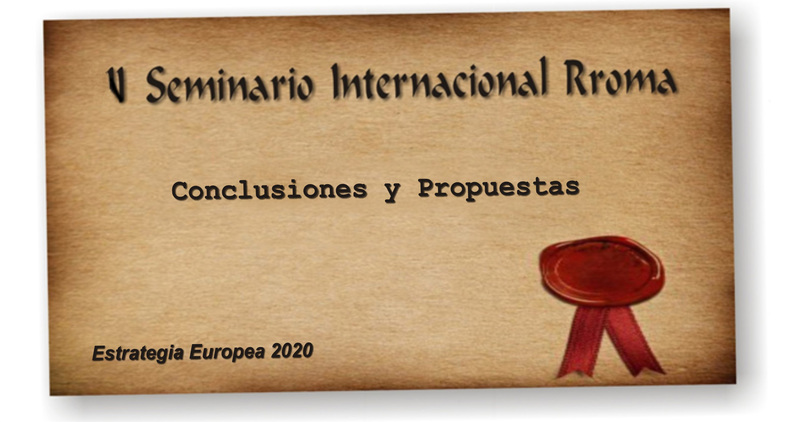 After having analyzed and discussed in two working groups on the course of actions to the inclusion of the Romani community, we could conclude and observe it is not being taking into consideration one of the fundamental premises which includes the 2020, referring to prioritize the participation of the Romani people in development processes and implementation of programs. A situation that not only is occurring in the field of local, regional and national governments, but also in the European Government. That having explicitly defined the need to involve the Roma community and to grant the necessary resources by modifying, it still continues "giving back"the necessary structures. The clearest sign that the European Commission does not act accordingly with what promotes and legislates, can be found in the recent resolution of RIGHTS, EQUALITY AND CITIZENSHIP PROGRAMME - 2014/2020 - (CALL FOR PROPOSALS JUST / 2014 / ISDN / AG / DISC - Action grants to support projects on non-discrimination and Roma Integration). A call in which, for the first time, the participation of Romani organizations is prioritized regardless of their size and where, apparently, we made possible the power to develop local actions, having eliminated for that of the baremación, aspects that until then They prevented us from accessing or have real possibilities in any of the European programs. However, in its final resolution, we have seen that there has been chosen not one of the projects that many Roma organizations from all over Europe had presented being, once again, universities, administrations, foundations or consortia of educational enterprises, to pursue a dynamic work been doing for decades and has not served at all. It is evident that, if not corrected this situation, the efforts and investments made until 2020 in inclusion of the Romani people, will fail to improve the life of our communities, regardless of what later reflect reports at the time issued administrations, governments, universities or non-Romani macro entities receiving the most resources. Let disillusionment with the expectations we depart from the path of claim and the work that we carry with so much effort over many years, assuming everything is a lie, a political and a interest game, but nothing will change. Follow up and keep walking although they take us everything, to give voice to our people, to tell the truth even if they contradict the reports or "official versions" and ... above all ... to build and to propose solutions to change course and generate a new hope. While there are certainly times when "throw in the towel" seems the most reasonable option for us, without a moment's hesitation, we chose the second option. So in addition to fixate on our determination to continue struggling to tell the truth to whoever and wherever necessary, we have also developed a range of specific proposals to correct the course maintained until now (see proposals). Because although they take us everything , which they will never obtain from us, will be deprive us of our dignity as a people.